The four programs below run under all versions of Windows from Windows XP to Windows 10. (They can be run on Macintosh computers only by use of a Windows emulator.) The downloadable trial versions can be made fully-functional by means of an activation key. The key can be sent immediately upon purchase of a user license (or can be obtained soon after). Updates to new versions are free. For full descriptions click on the program titles. For each program there is a link to PayPal for purchase of a perpetual (time-unlimited) user license. For all programs, a user license is also available for use of the software for 3 months or 1 year. To purchase a time-limited license, click on the program title to go to the product page and follow the Purchase link. See also our combo offer. 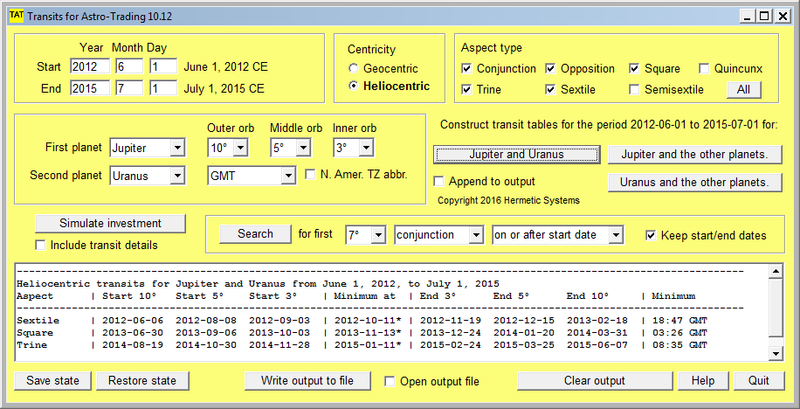 PAT is a program to calculate geocentric aspects between planets at a given date. Also displays personal transits for a given birthdate, and synastry for two birthdates. It identifies aspect patterns (such as grand trines and yods) and supports searching for occurrences of them. It has graphical and dynamical displays (as well as tabular) which show how transits change over time, and how the position of a transiting planet changes. It supports both tropical and sidereal zodiacs. HPAT is the heliocentric version of PAT, and does everything that PAT does (except, of course, that the Moon is not included). In addition, when searching for the occurrence of a particular aspect pattern one can ask it to search for an aspect pattern involving up to three specified planets (e.g. a grand trine involving Earth and Pluto). 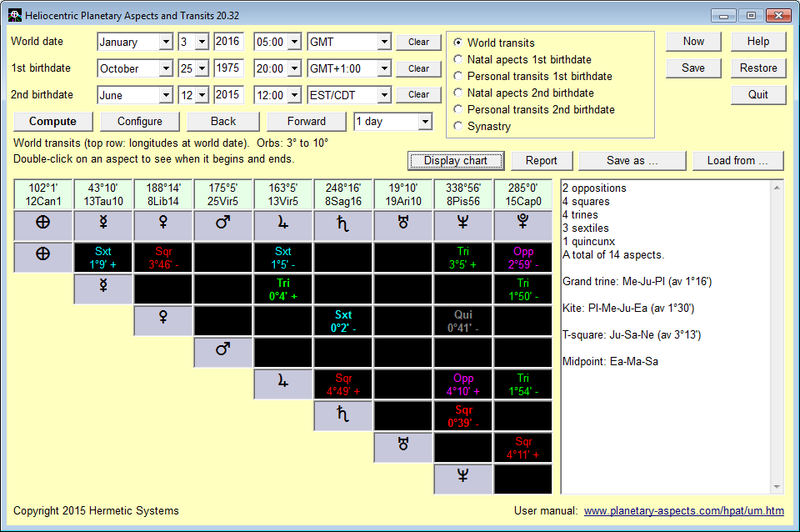 YPT calculates the exact dates and times at which geocentric transits between two selected planets begin and end (relative to chosen orb values). It produces transit tables for both world (a.k.a. mundane) transits and personal transits. It supports both tropical and sidereal zodiacs. 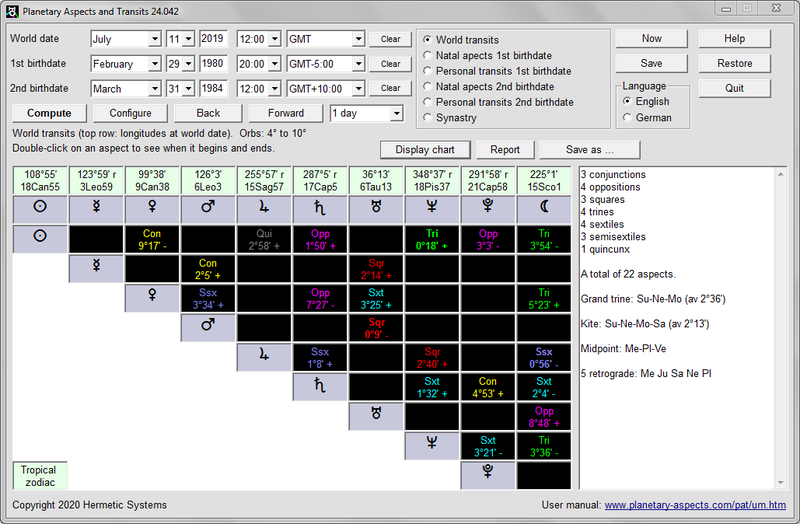 TAT produces transit tables showing the exact dates and times at which geocentric and heliocentric transits between two selected planets begin and end (relative to chosen orb values). Also allows searching for a given aspect between two planets. These programs run under all versions of Windows from Windows XP to Windows 10. The software (after download) can be made fully-functional by means of an activation key sent by email after purchase of a user license. Updates to new versions (if any) are free, as is tech support for the duration of the user license. Paying via PayPal you can obtain a discount of from 30% to 50% by purchasing perpetual user licenses for 2, 3 or 4 programs at once. for custom software development at an affordable rate.